Input text: a ball. it is dawn. a 20 feet tall 1st pyramid is 50 feet behind the ball. a 14 feet tall 2nd pyramid is -1 feet left of and -15 feet in front of the 1st pyramid. a 15 feet tall 3rd pyramid is -5 feet right of the 1st pyramid. a 5 feet tall 4th pyramid is in front of the 2nd pyramid. a 5 feet tall 5th pyramid is left of the 4th pyramid. a 5 feet tall 6th pyramid is left of the 5th pyramid. a 9 inch tall rye beige egyptian sphinx is 50 feet left of and 10 feet in front of the ball. the egyptian sphinx is on the ground. a 20 inch tall solid rye beige dodo is -20 inch above and -22 inch in front of the egyptian sphinx. the sphinx has a sand texture. the dodo has a sand texture. the camera light is black. 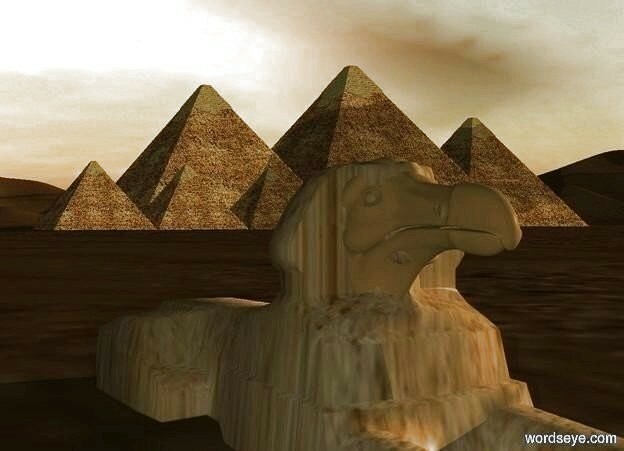 a dim white light is left of and in front of the sphinx. the ambient light is pewter gray.